There are some exceptions with which I am familiar in the United States, such as Silver Dollar City, Knoebels Grove and Dollywood. Nevertheless, for too many years, parks have got it wrong. This is not just my belief; it is the belief of millions of park-goers around the world. But why should parks bother improving when food and beverage remain the best generator of a park’s revenue after ticket sales? This fact is accounted for probably only because guests are a captive audience and have to eat, not because they like what they are being offered. Recently, it appears some parks have seen the light. Incidentally, European parks have in my opinion always offered better food. I remember a meal 30 years ago at Phantasialand in Germany that would rival any New York restaurant! For Europeans, meals in parks can be a different prospect than for Americans, who are more inclined to “grab and go.” But things are changing. Meal times are now becoming an integral, part of a guest’s visit. They want it and demand it as part of a group visit with their friends and loved ones. As parks introduce new themed lands, a little bit more thought it being given to both the quality of food and beverage offered, and the environment in which it is served. Recent examples include the restaurants at Universal’sWizarding World of Harry Potter, including the Three Broomsticks and Hog’s Head Pub. Food is getting better. It’s actually tasty and people like it! And who can forget those Butterbeer sales, which exceeded $5 million the first season alone? 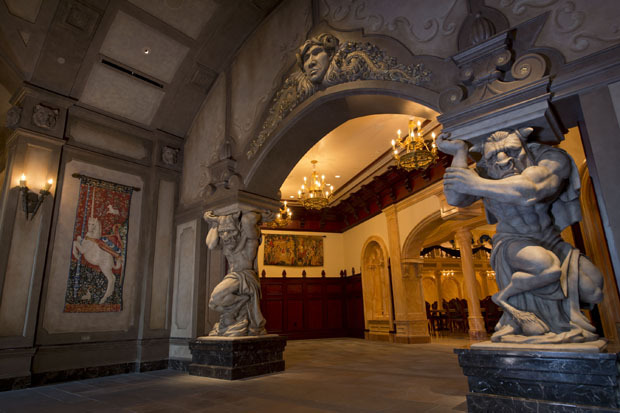 At Walt Disney World’s newly expanded Fantasyland, which opened last month, the Be Our Guest Restaurant is not only extraordinarily beautiful, but it has a great menu too. It offers French cuisine, as well as sandwiches, salads and other healthy fare. The food is not cheap – with prices ranging from $15 to $36 – but the difference now from a few years ago is that the food is high quality and worth the price. It has not always been like this, I can assure you. Disney even sells alcohol at its new restaurants – something only 20 years ago it vowed it would never do. Champagne, red or white wines of very good quality, and a variety of beers from around the world are all on the menu for Be Our Guest diners. And why not? Park visitors have demanded higher quality food and beverage for years, Plus, alcohol sales deliver a great profit margin. Park food has come a long way from the cheeseburger served in a Styrofoam box, sweaty and stale. But it has taken far too long to get here. During the next five years, we are going to see more progress than we have in the last 40 years. It’s a win-win. The guest gets a better food experience – and so is more likely stay longer or come back on a repeat visit – and the parks see higher revenues as a result. Bon appetit! Dennis Speigel is president of International Theme Park Services (ITPS), based in Cincinnati, Ohio. ITPS is the industry’s leading, independent management/consulting firm, offering services including feasibility analysis, design/masterplanning, pre-opening operational planning, on-site management, sponsorship & marketing, executive search and business audits.